Welcome to Woof Wednesday. Please meet some special dogs and real gems from CA, OH, PA and TX all in need of good, loving homes! Any and all help is always appreciated, feel free to use any means of social media to get the word out about these dogs. 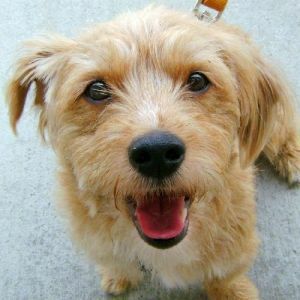 Vinny is a friendly 3 year-old male who looks just like a Norfolk Terrier. He was a stray that we pulled from a rural county dog pound so we don't know for sure if he's a Norfolk or not but he sure looks like one. Vinny was adopted for a couple of months and recently returned because he didn't get along with the grandchildren in the home. Vinny would prefer to live with a mature family where he wouldn't have to deal with any small humans. He's a very affectionate dog who loves to sit on your lap and cuddle. He doesn't really play with toys and just wants to be your pal. Vinny likes to go for walks and his previous adopter said he was house trained. He doesn't really enjoy being in a crate but has adapted to it in his foster home. He gets along well with the dogs in his foster home but might prefer to be the only dog in the home so he can get all the attention. Meet Tootsie one look at this little doll and you will be a smitten kitten. She is just as perfect and wonderful as she looks and will make a super addition to the lucky family who adopts her. Tootsie's people are seniors and their living situation has changed and they cannot bring Tootsie with them. Imagine how sad they are but you can make that sadness disappear by fostering and/or adopting this girl. At 9 mos. she is spayed, completely house trained, happy, great with dogs and kids- and of course she is playful and energetic. Westies are merry little dogs- and Tootsie seems to have all of those traits. Her unknown genetic donor must also be super because this dog is a gem.....a real gem! 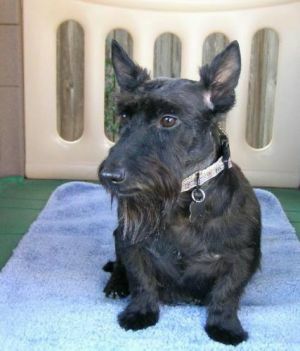 Angus & Sara 5 year old Scotties came to us as a transfer from another rescue. They had been in a home, but were no longer wanted. They are an adorable couple! 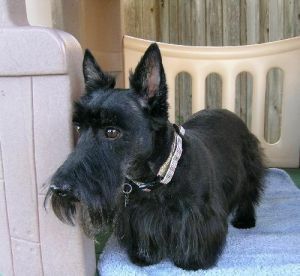 They have great personalities and of course are loyal Scotties through and through. They will only be adopted together. Let's find these sweethearts the loving home they so deserve! Bart and his sisters Bess and Brie are part of the hoarder group. 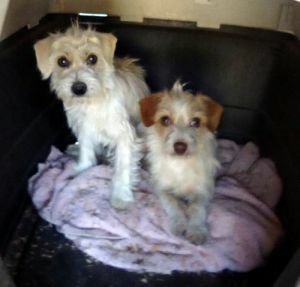 They are Jack Russell/Poodle Mix terriers. Bart is the smooth coated one and the girls are the fuzzies. They are still very shy and will need patient, loving people in order for them to realize their full potential as companion dogs. All of them are great with other dogs and would do best in a home with another dog for them to model their behavior after. This sweet little Chihuahua/Jack Russell Terrier doesn't even have a name. Not much is even known about her. Please she desperately needs a good home. When contacting the shelter her Id number must be given. Let's find this little girl the home she so deserves! *If you want to be apart of "Woof Wednesdays" email Lauren at [lcairdo@gmail.com] or leave a comment! We would Love to bring you on board! Or just start posting about a dog in need of a home on your blog or facebook page!